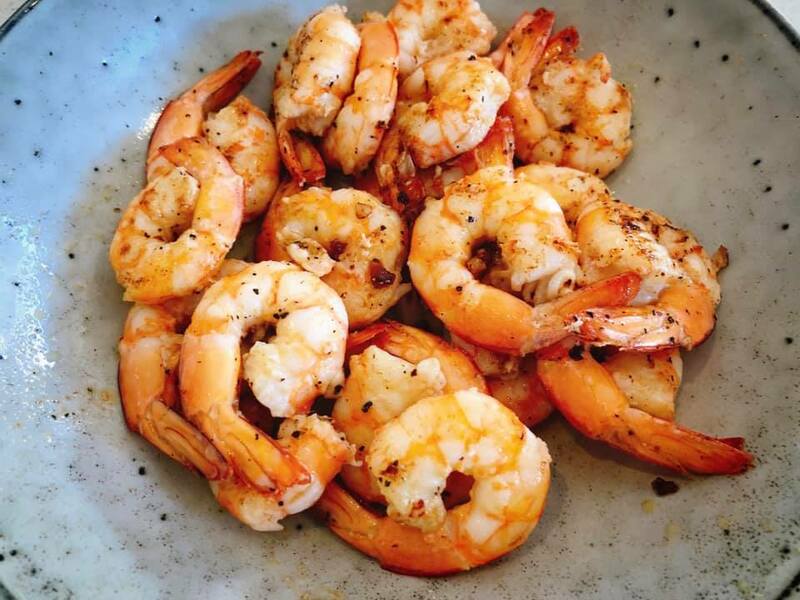 This dish is soooooooooooooooooooo amazing. I actually shocked myself at how delicious it was. Quite seriously, I like salads, but I could eat a truckload of this one… and did. Like a lot of Asian dishes, it is dairy and gluten free. So this was a happy food re-discovery! I have made this once before… literally about 8 years ago. My lovely father-in- law has a few paw paw trees in his garden, and one tree in particular bore about 25 paw paws this season!! 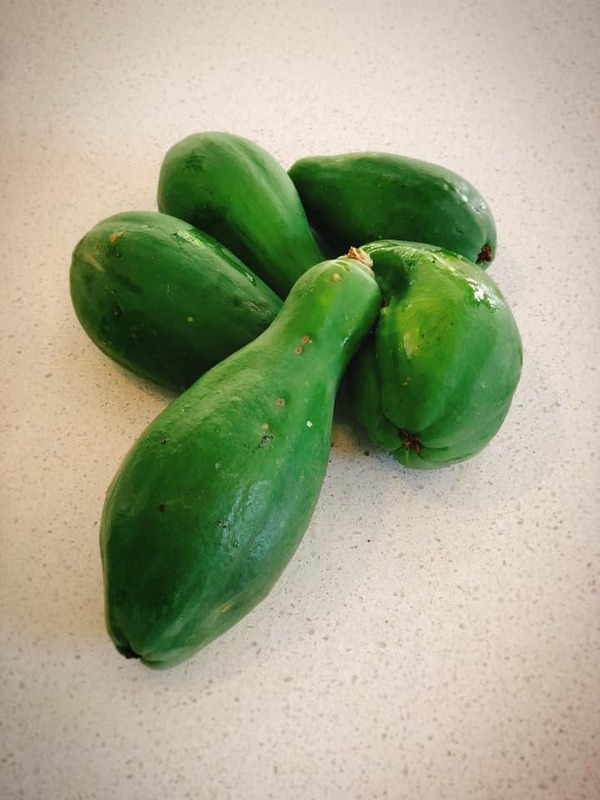 We had chatted about it, and after he harvested them, he dropped off about 10 small green papayas for us (and made some chutney with the rest!). Green papayas are so hard to get a hold of. 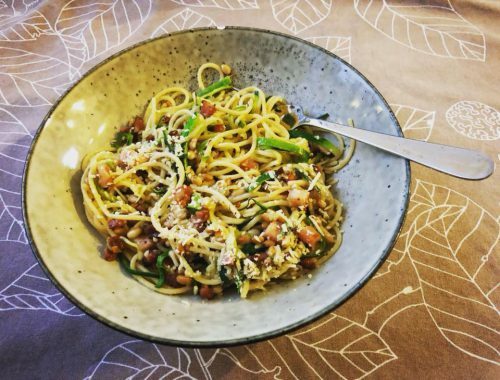 I remember when Troy and I got home from our honeymoon in Fiji, I had made a green papaya salad (as we had eaten it while away), but the best I could find was some “not quite ripe” papayas, and although still delicious – it was not quite the same. The unripe, green paw paw was almost neutral to taste. Maybe a little bit like cucumber, but not as juicy and a little bit more fibrous. Just perfect though in texture and as a carrier for the dressing. So anyhoo, I HAD to get onto these gorgeous fruits before they started to ripen, and I am so glad I did. I looked at quite a few recipes online, to get an idea about quantities and ratios, but in the end, just made up my own recipe to suit my own taste. I used fresh green Australian King Prawns (instead of dried shrimp), added shredded chicken, coriander, spring onion and bean sprouts, changed the green beans to sugar snap peas, added crunchy fried shallots and then also had to fiddle with the dressing quantities as we ended up with more green papaya than I thought we would once all the fruit was shredded. The key is always to taste as you go and adjust depending on what it tastes like to you at the time… if you are a beginner you might wonder how you might do this or how you will know what is missing, but you gotta start somewhere!! There is no cooking in this recipe, but there is a bit of elbow grease! It is pretty fast to make, even in larger quantities, provided you have a food processor to shred your papaya’s. Chopping by hand I would imagine would take aaaages. Wash and peel the green papaya. A word of warning – they are actually harder to peel than you’d think!! 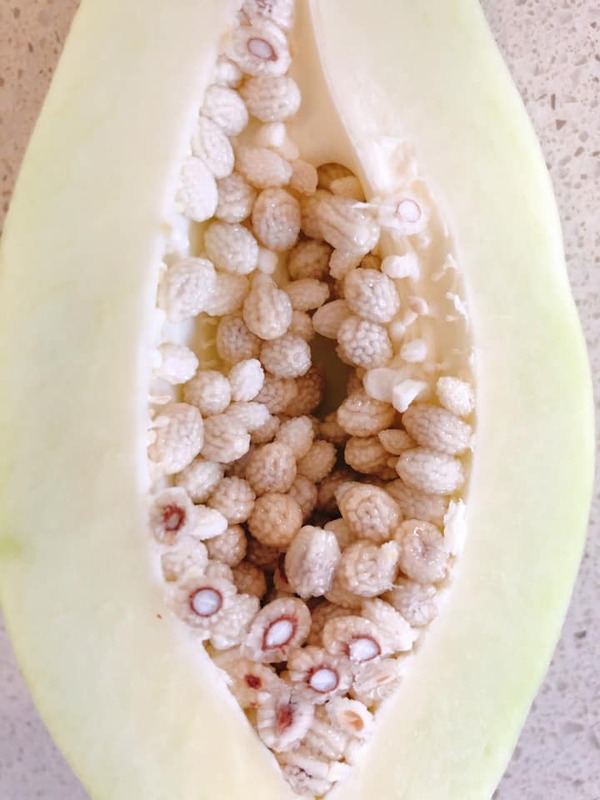 There are white seeds in the centre of the fruit that you will want to get rid of (see gallery of images above). Weirdly also, there is a white sap under the skin that leaves a slimy residue on your hands and it doesn’t easily come off with hand soap. I used Morning Fresh dishwashing liquid in the end to get rid of it… but you might want to use gloves. 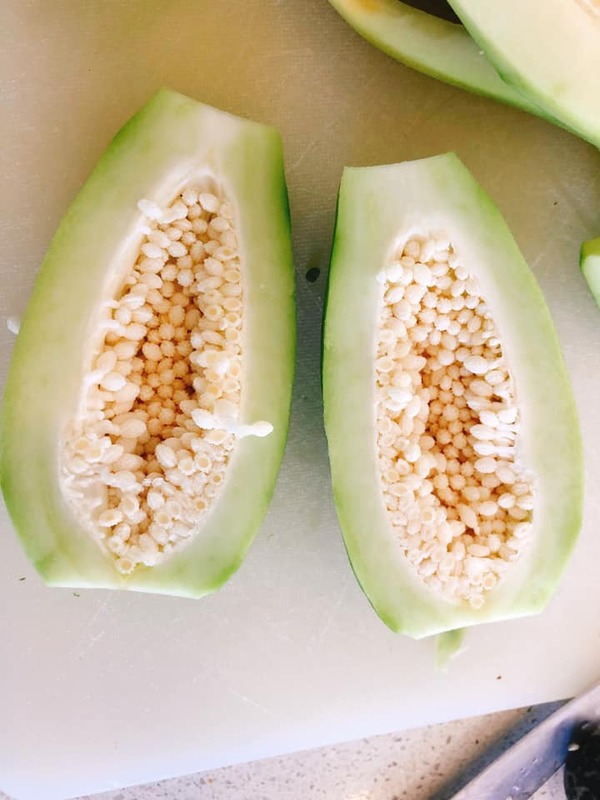 Shred the papaya flesh – you can use a julienne peeler, chop with a knife, use a cheese grater OR use a food processor like me (MUCH faster). 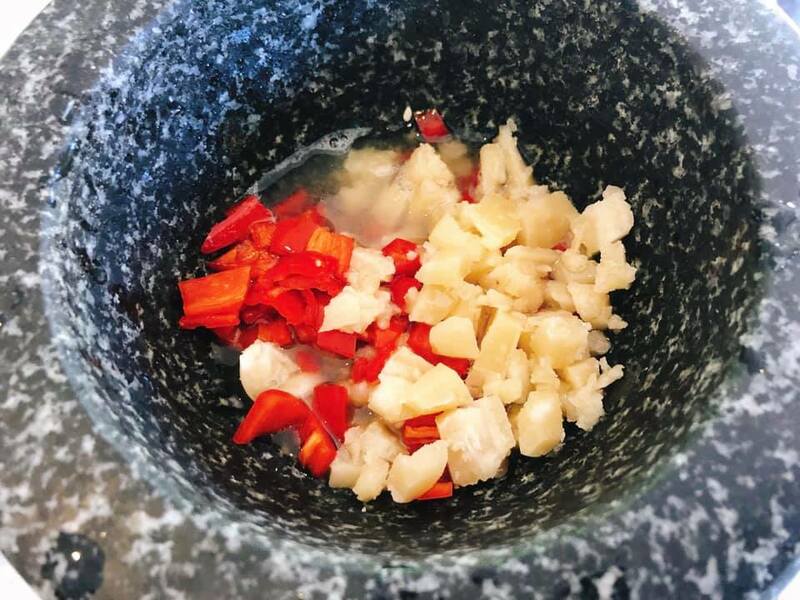 Roughly chop your garlic and chillies and then stick them into a mortar. Pound them with the pestle until they are crushed and in bits. 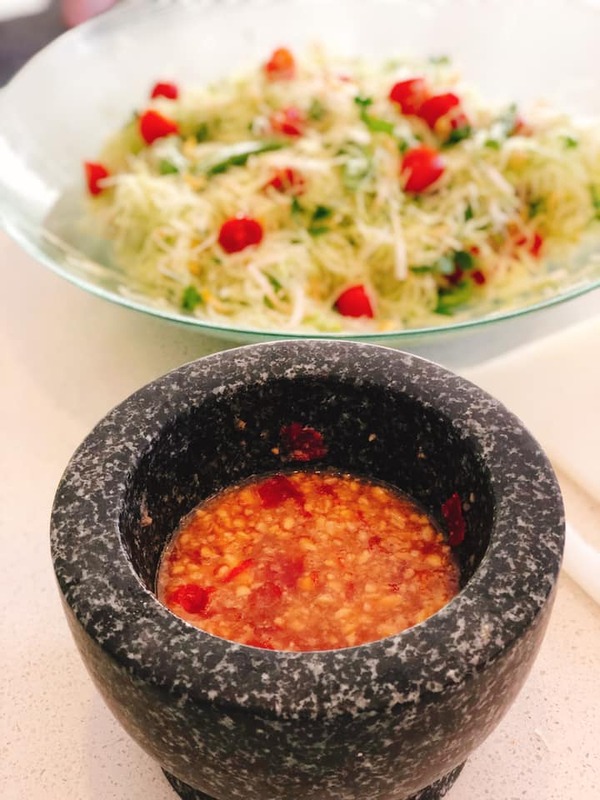 Add about a half tbs of palm sugar, about 1 tbs fish sauce and the juice of 2 limes into the mortar – MIX, making sure the sugar gets dissolved. 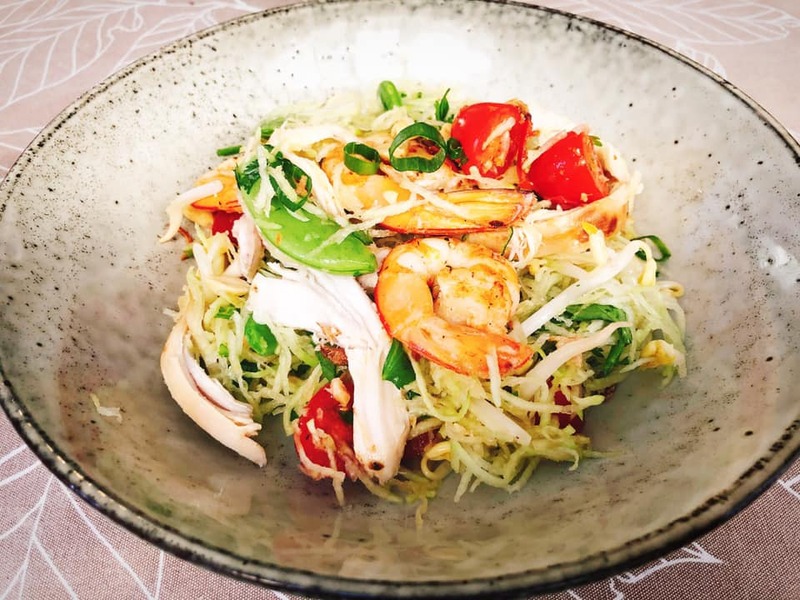 Toss the shredded papaya, halved cherry tomatoes and the dressing mix in a large bowl to coat everything. 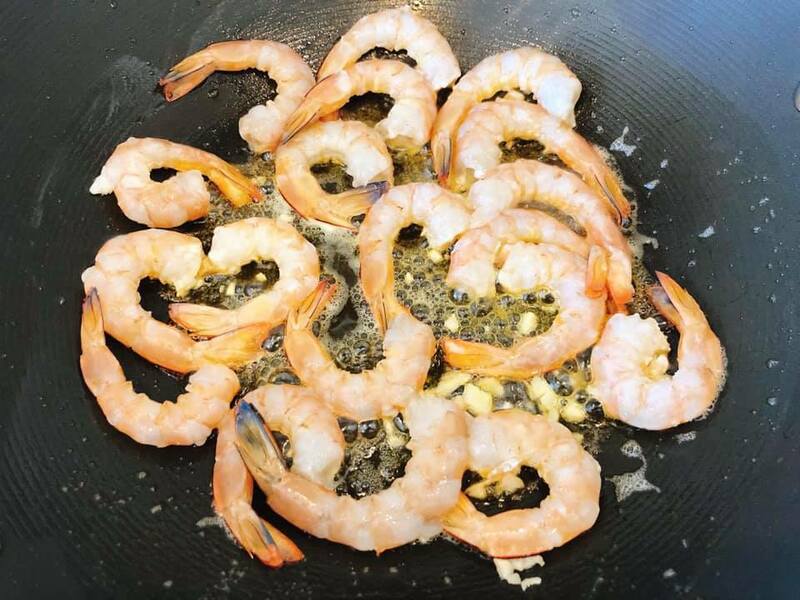 Plate up into your serving bowl and top first with your shredded chicken and then garlic prawns. This was seriously one of the yummiest salads I have ever eaten. I wish green papayas were more readily available and mainstream supermarkets! 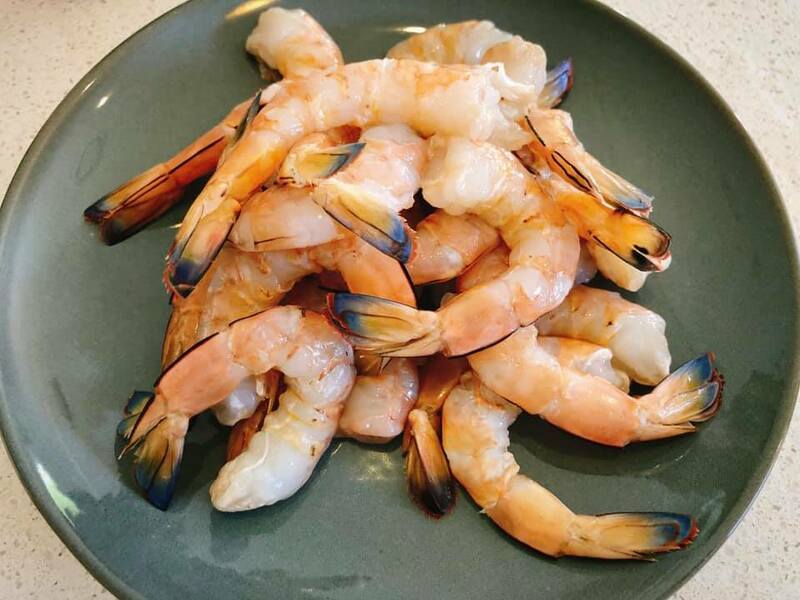 I hear that they are easily purchased at Asian supermarkets – but I must admit that I rarely have time to get out to Sunnybank to go shopping so I can confirm that. 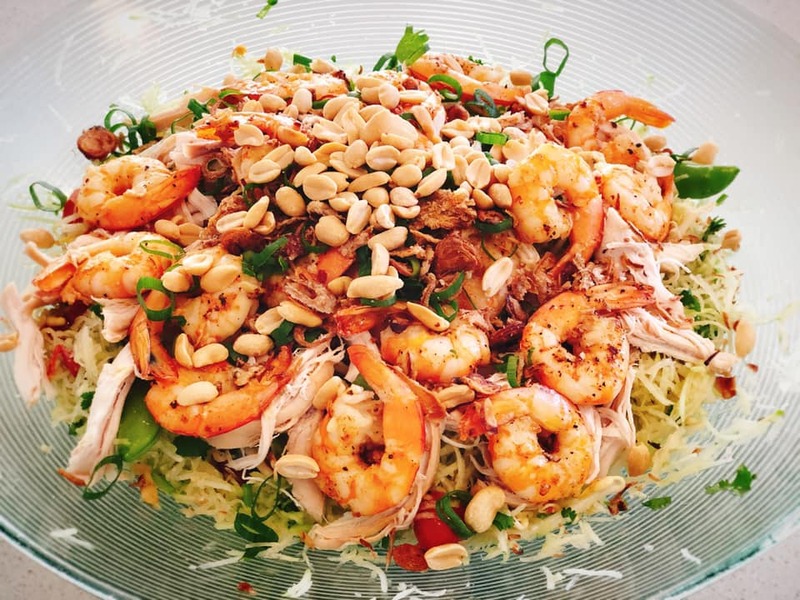 I watched Rick Stein’s show (I think it was called “Far Eastern Food Odyssey”) the other night and they made a very similar salad to this using green mangoes (and instead of using prawns and chicken, he used chopped belly pork). I will be trying this NEXT mango season (next door neighbours have a stringy mango tree and no one eats the mangoes off it) for sure. 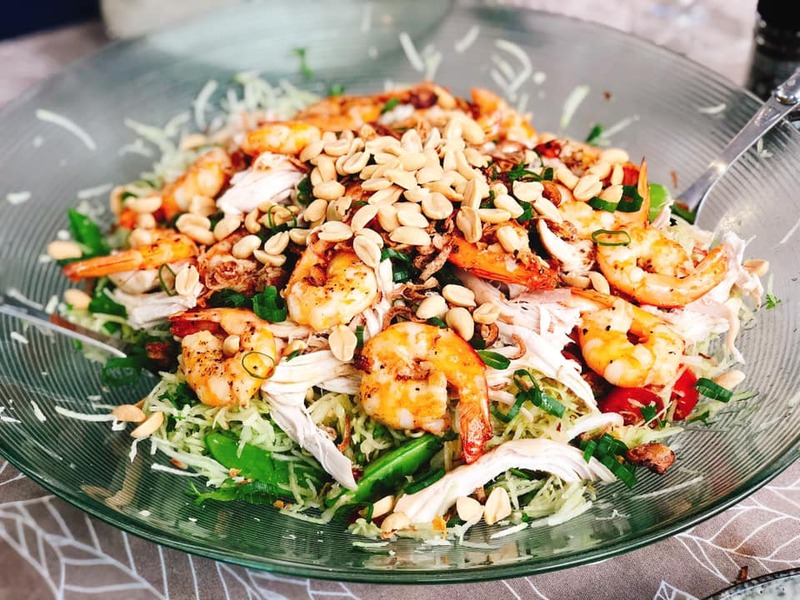 Pleeease do yourself a favour and give this salad a go. It is now my all-time favourite salad. Soooo good. Let me know if you try it!! 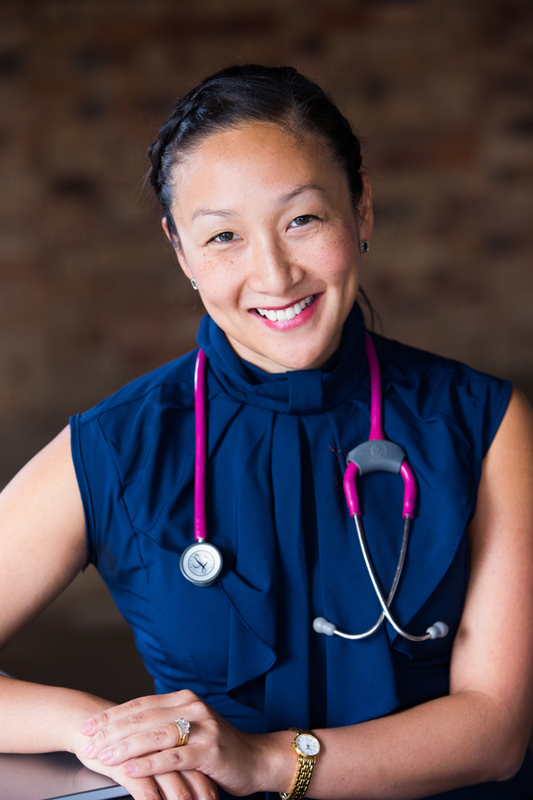 Catch you next week for another Medical Monday! !